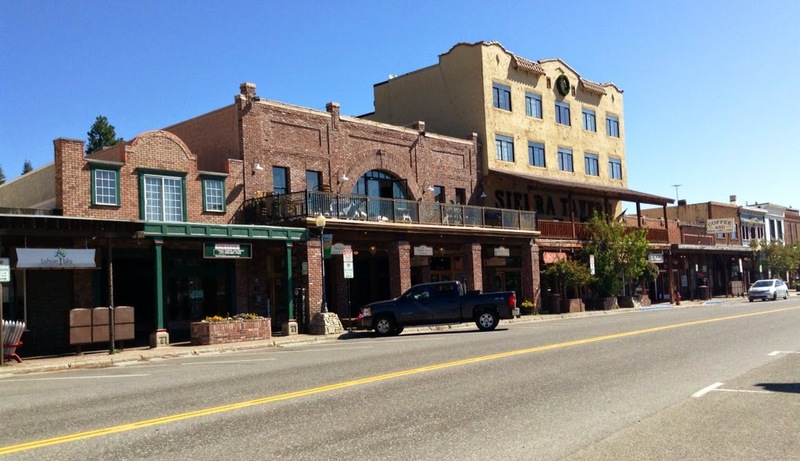 Truckee offered our first real grocery store (Safeway) in ages. It was nice to have a full selection of grocery store items. It was also nice to purchase reasonably priced food; most of the foods we've purchased in the smaller markets the last two or so weeks have been ridiculously priced. 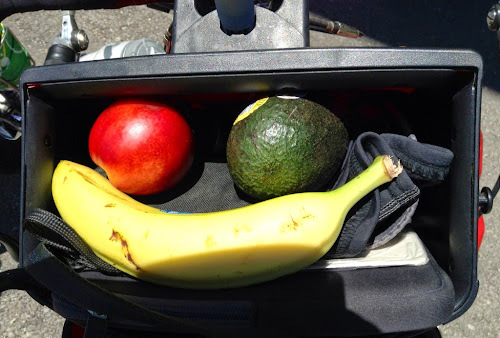 Fruits riding safely in my handlebar bag. Because we burn through so many calories, we often have two breakfasts (one when we first wake and another an hour or so down the road) as well as two lunches. We had our first lunch of the day in Sattley. There wasn't much to the town, and so we sat outside the volunteer fire station to consume our calories. We could occasionally hear chatter over the radio inside. Unable to decipher the radio talk, we were half-expecting the crew of volunteer firefighters to pull up to the station at any time. 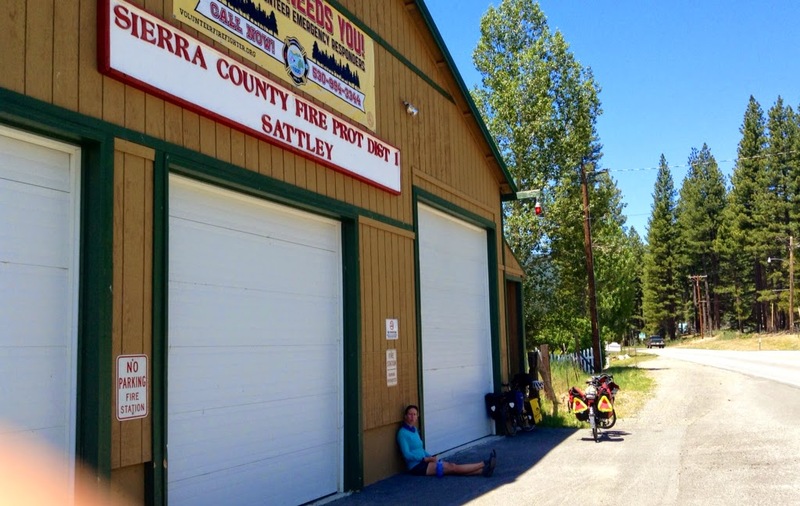 Lunch outside the Sattley volunteer fire department. Across the street from the fire department was the Sattley Cash Store and Post Office. Probably the main store in town at some point in time, the store looked as though it had closed decades ago. This 7up sign, painted on the side of the Sattley Cash Store, brought a smile to my face. All the signs we've seen indicating distances of upcoming towns have been expressed in terms of miles. 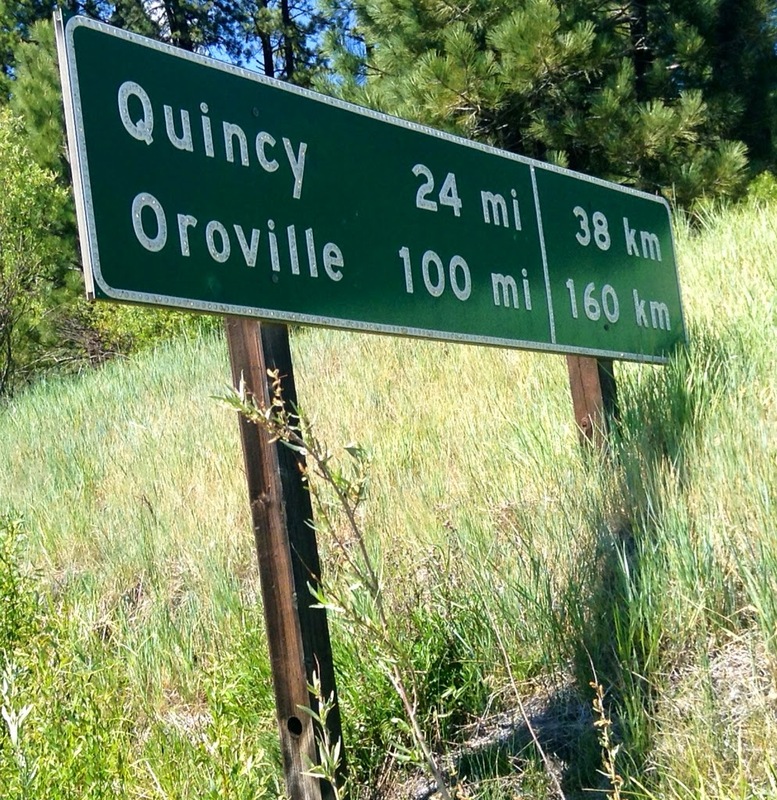 Oddly, the sign below expresses the distances in both miles and kilometers. Alex joked that this was a sure sign that we must be getting closer to Canada! Kilometers! We must be getting closer to Canada! 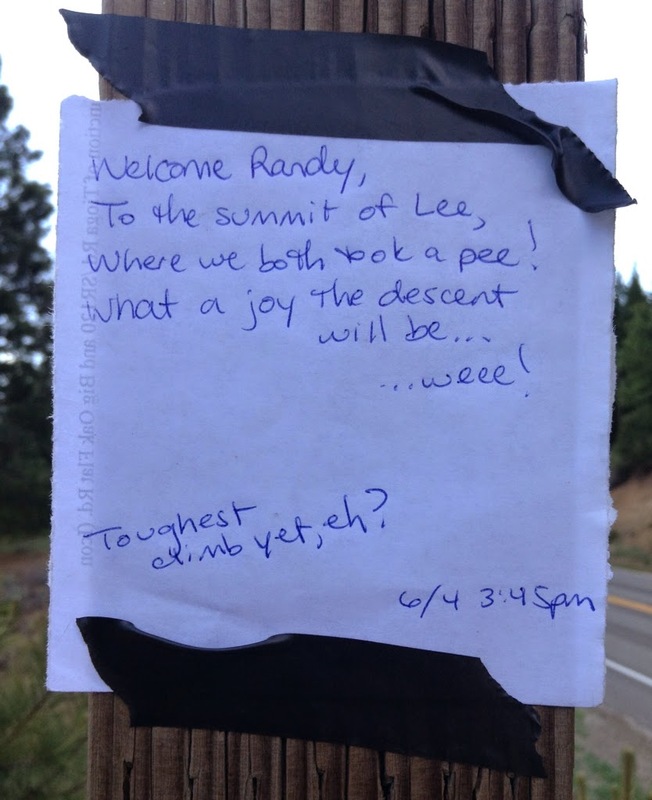 We've decided to leave a note for our dear friend, Randy, at each of the summit signs. Naming the unnamed summit after Randy. Our note on Lee Summit. Lee Summit was, by far, the saddest excuse we've seen of a summit. 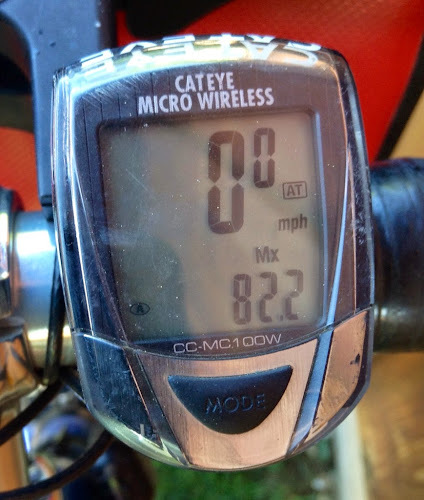 Traveling from the south, as we were, the summit was no higher than any of the other rollers we had topped in the previous 20 or so miles. As we were leaving the note for Randy at Lee Summit, a sheriff pulled up and asked us if everything was okay. Fortunately, Alex had finished peeing two seconds earlier, and I had not yet popped-my-squat. We made small talk, and then the sheriff was on his way. 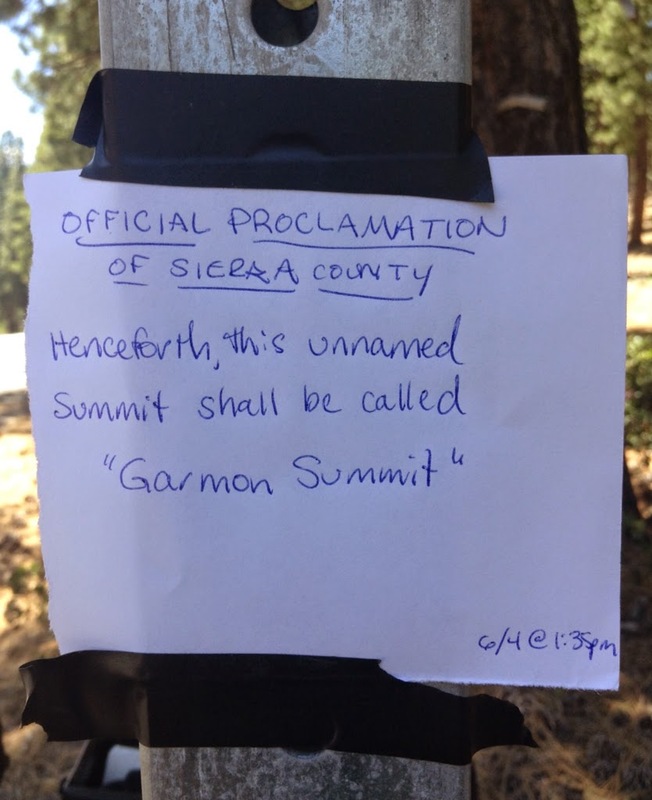 Wildfires, as you well know, are a big deal in California. 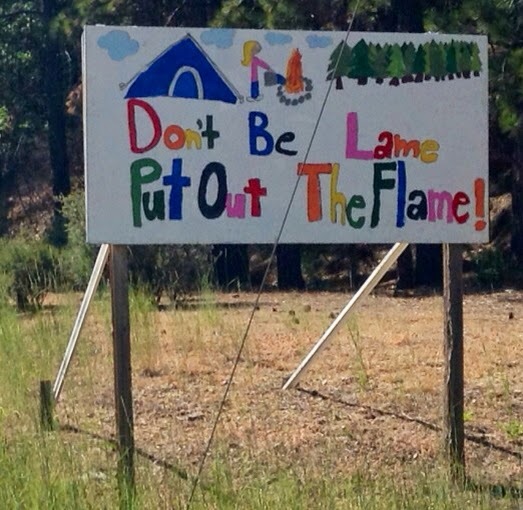 Along the route, we've seen tons of messages about the current fire potential, having defensible areas around homes, and the such. We've also seen billboards featuring children's artwork for fire safety. 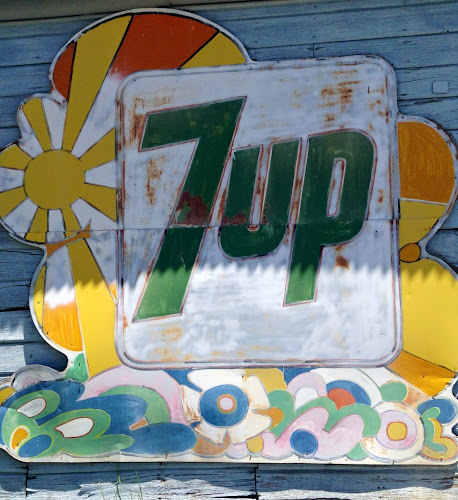 The billboard is a spitting image of the drawing I would have done when I was a youngster. We are camping tonight at the Plumas-Sierra County Fairgrounds. 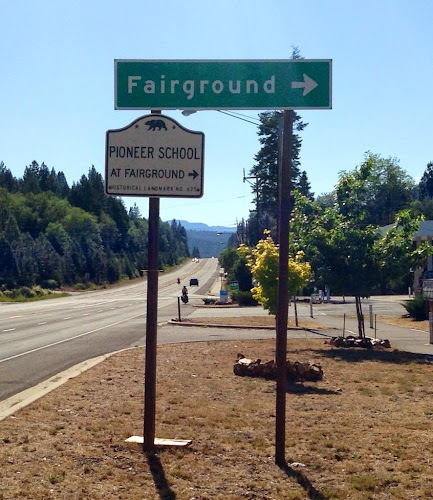 I camped at a handful of fairgrounds on my cross-country bike trip last summer. I love camping at fairgrounds. 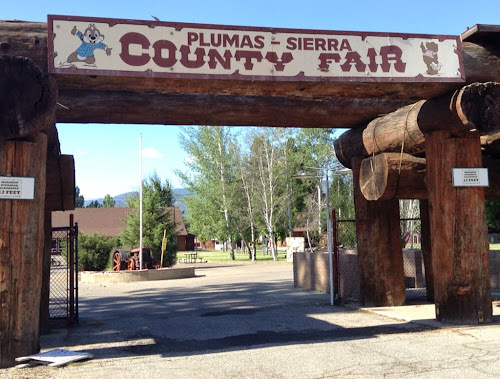 They are generally very reasonably priced, and they are a fun place to hang out without the typical fair crowds. 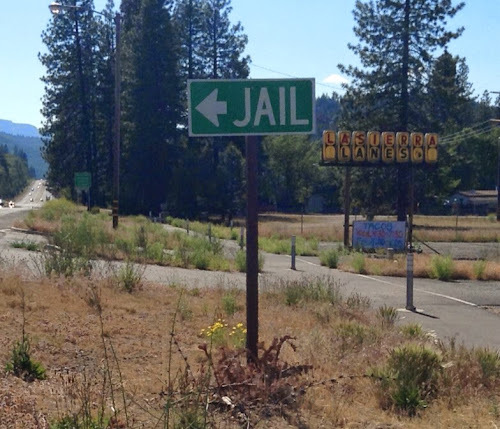 The jail is nearby -- a little too nearby. A few blocks from the jail. 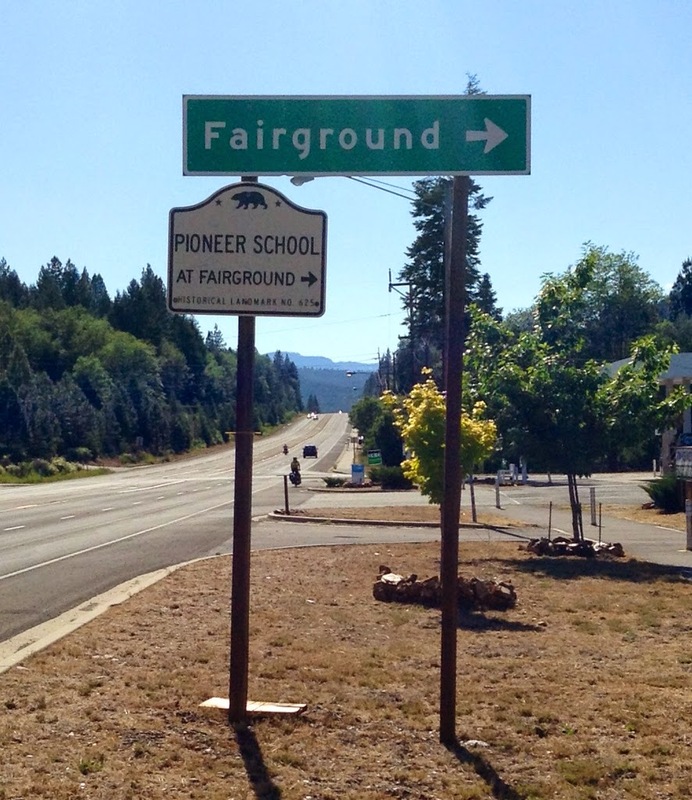 The grand entrance to the fairgrounds. Our Adventure Cycling maps list the fairgrounds as a camping option in Quincy. The maps note that the fairgrounds should be contacted in advance to ensure that the restrooms are opened. I called the phone number for the fairgrounds this morning and left a message, indicating that we'd be staying at the fairgrounds this evening. A little while later, I received a voicemail from John, confirming that we could camp at the fairgrounds and that he would open the bathroom for us. John went above-and-beyond. 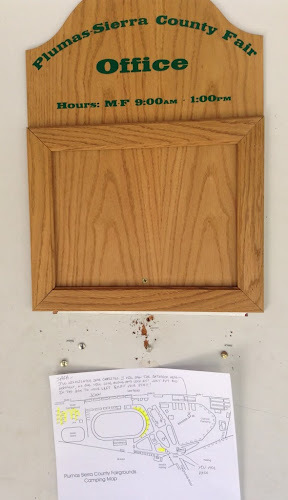 Not only did he call me two times (we were playing phone tag, as I didn't have cell reception for a good part of today's route), but he also left a note for us on his office door, along with a map of the best places to pitch our tent on the fairground lawn. I can't think of a better place for us to pitch our tent for the night. It's quiet, and we have the whole place to ourselves! Although showers aren't part of the fairground offerings for tenters, John said that we could help ourselves to a shower. Sweet! On the phone, John mentioned that they like to accommodate non-leather wearing bikers. I confirmed that we didn't wear leather, though we did wear spandex. Dinner tonight was air-temperature tomato basil soup and sourdough bread. Soup'n'bread is one of my favorite touring dinners. It's a filling combination. 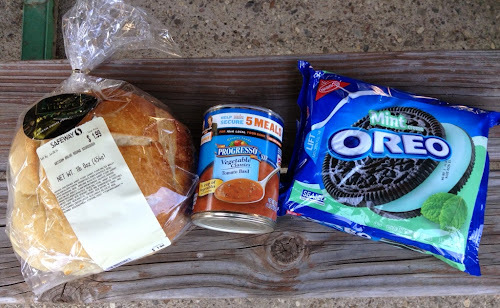 I followed up the soup'n'bread with a row of mint Oreo cookies. I don't typically eat cookies for dinner. But having been on the road for a month now, I'm starting to get rather thin. I'm needing empty calories to prevent myself from turning into mere muscles and bones. A little fat on the skeleton is good for women. It was another wonderful day of touring. The highlight of the day was leaving our little notes for Randy at the summits. We hope that he finds them, and that the notes put a smile on his face. We also hope that they provide motivation for Randy to pedal to the next summit. We miss you, Randy! I'm enjoying your journal, Sarah! You're such a good writer, very funn, whip smart! If I wasn't thoroughly impressed with and liked you a helluva lot already this single line would've done it "A little fat on the skeleton is good for women." No truer words have ever been said! Last week I was able to try Lemon Oreos. YUM!!! Learning a lot from this trip folowing you, keep it up! Ha, ha, you're a funny guy, Tony! If nothing else, fat is good for keeping warm. I've noticed that I get goose bumps a lot easier when I'm on these bike trips. Hmmm, lemon Oreos sound good. I didn't realize that was a flavor. Thanks for the heads up!